Will Elites Ever Respect Voters' Decisions on Brexit and Trump? It was no coincidence that Donald Trump scheduled a trip to Britain to promote one of his golf courses in Scotland, on June 23, 2016. That was the day of the Brexit referendum in which 52 percent of the electorate --17.4 million voters, more than any party has ever won in a general election -- voted for the UK to leave the European Union. Candidate Trump's earlier endorsement of Brexit was criticized by elevated opinion as an unfriendly interference in another nation's internal affairs, although few, if any, had similarly criticized then-President Barack Obama for having urged Britons to vote "remain" and threatened that if they were to vote "leave," they would go to "the back of the queue" in seeking a free trade deal with the United States. Thirteen months before Trump's trip and the British vote, few thought there was any possibility of a Trump candidacy or a Brexit referendum. The shock of Brexit in June and Trump's victory in November has not been fully absorbed by British or American financial, media and political elites since. As the gifted British political analyst Douglas Murray writes in National Review: "instead of accepting the votes and trying to learn from them, elites have expended almost all their available energies trying to pretend that voters in 2016 were bad or duped. The past two years could have been spent trying to learn something or build something. Instead, the best minds of Left and Right have spent their time making claims of 'racism,' 'Russia,' and 'Cambridge Analytica.'" The unlearning continues in both nations in these opening weeks of 2019. Here, government (actually, less than one-quarter of the federal government) is shut down over Democrats' resistance to President Trump's demand for funding the border wall -- er, barrier -- which he negligently failed for two years to obtain from the Republican-majority Congress. Most Democratic politicians and, polls show, many Democratic voters favored border barriers before Trump's victory. Now they insist walls are "immoral" and "ineffective." The struggle over Brexit is more complex in Britain. One thing is clear: The incompetence of Prime Minister Theresa May, against whom Trump looks like a smooth operator. 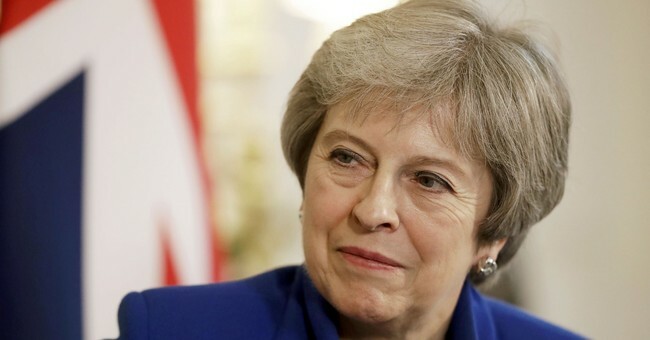 May voted against Brexit, and her pledge "Brexit means Brexit" has been undermined, purposefully or by blunder, in her negotiations with the European Union. The EU's unelected leaders are loath to see Britain leave and insisted on terms including a 39 billion pound (!) exit fee and a binding customs union with a backstop preventing Britain from leaving without EU approval -- more like No Exit than Brexit. May's deal was voted down Tuesday in the House of Commons by an astonishing 432-203 vote, the biggest rebuke of a government for a century, and she survived a vote of no confidence Wednesday by a pathetic 325-306 margin. Exactly what comes next is unclear. Under 2017 legislation, Britain leaves the EU March 29 and, if there's no agreement with the EU, will come under the low-tariff rules of the World Trade Organization. Elites predict that this "hard Brexit" will produce dreadful economic woes. Their similar predictions after the 2016 referendum conspicuously failed to occur. In negotiations with the EU, May squandered the leverage the WTO alternative could provide. Now preparations are being hurriedly made by civil servants and -- with more success, one suspects -- private businesses. Diehard Brexit opponents seek to delay the March 29 leave date or stage a second referendum. But either would require parliamentary approval. And the votes this week suggest that neither May nor anyone else commands a majority in the Commons. Diehard resistance by outraged elites, breathtaking incompetence by elected leaders: It seems to be a pattern on both sides of the Atlantic. Another similarity is the danger of a sudden empowerment of the left. Social democratic parties have been in a prolonged slump for a decade in leading democracies, from Germany, France and Italy; to Japan; to Colombia, Peru and Brazil. But Britain's Labour Party has moved far to the left under its syndicalist and anti-Semitic leader, Jeremy Corbyn. And America's Democrats, politicians and voters have been moving left, from House Speaker Nancy Pelosi's San Francisco to Rep. Alexandria Ocasio-Cortez's Queens. Perhaps the financial, political and media elites who haven't yet given up on overturning Brexit and ousting Trump might give some thought to the alternatives. Perhaps they might even practice the acceptance that they preached to Brexit and Trump supporters before they knew the outcomes they themselves still feel no obligation to respect.